Kratos’ General Microwave offers a wide range of microwave attenuators both as COTS and as customized products. For the past 50 years, Kratos’ General Microwave has been an industry standard in microwave discrete pin diode switches. Today, Kratos’ General Microwave’s catalog line of switches offers the designer a cost effective approach for discrete components needs by offering a comprehensive catalog of SPST to SP16T switches, with various standard options as COTS products. In addition, Kratos’ General Microwave offers customized switches. For over 50 years, Kratos’ General Microwave has been a leading supplier of RF/microwave and millimeter wave products and technology solutions. Primarily focused on electronic warfare, ECM and radar applications, Kratos’ General Microwave supplies a comprehensive portfolio of COTS products, as well as highly complex, highly integrated assemblies and sub-systems. Our manufacturing facility incorporates state-of-the-art design simulation capabilities, state-of-the-art automated testing and phase noise measurement equipment. Many of the most stringent environmental tests are conducted in-house due to our extensive environmental test capability. To date, we have delivered thousands of integrated assemblies and systems for military applications, with most of these having been proven successful in a combat environment. 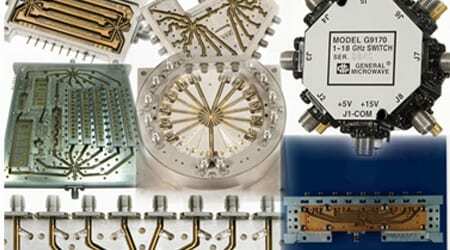 For more information about Kratos’ General Microwave’s Integrated Microwave Assemblies products.